Set off your M-Class factory rims with our easy-to-install Wheel Graphics kit. The set comes with twenty (20) precut decals (no trimming required) with a gradual fade of black on clear as shown. Black faded image is printed on automotive grade clear vinyl with an eight (8) year outdoor durability warranty. As a bonus, we also include - for free - four (4) "Mercedes-Benz" and four (4) "AMG" badged decals (one  for each wheel) that'll highlight and spice up your wheel set as shown. 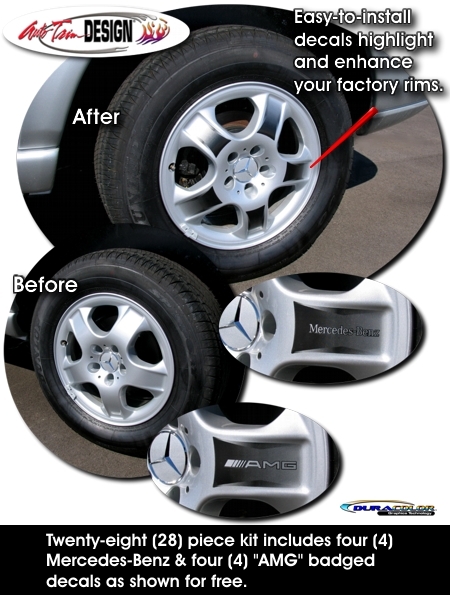 Wheel graphics will fit all ML350 vehicles with factory rims that look like the set as shown in the image.